EnergyForward is how we’re doing our part to provide safe, reliable and clean energy while helping to transform the way energy is produced, delivered and used. We’re strengthening the electric grid that delivers energy to homes, businesses and industry. We’re generating more power from renewable sources like the wind, water and sun. And we’re helping customers find ways to understand, manage and reduce their energy use. Our road map to a cleaner energy future is based on a balanced and diverse energy mix of renewable energy, baseload coal and natural gas. Our next step in providing safe and reliable energy from increasingly cleaner sources to our customers involves adding more wind and solar and employs the flexibility of natural gas to ensure power 24/7 for customers. Natural gas: Partner with Dairyland Power Cooperative to build a combined-cycle natural gas power plant in Superior, Wisconsin. About 250 megawatts will come from the jointly owned Nemadji Trail Energy Center. Online in 2025. Solar: Add 10 megawatts of solar power through a power purchase agreement with developer Cypress Creek Renewables. The developer plans to build an array near Royalton in central Minnesota. Online in 2019. Wind: Add 250 megawatts of wind energy through a power purchase agreement with Tenaska. The wind developer plans to build a wind farm in southwestern Minnesota, which will add geographic diversity to our wind energy portfolio. Online in 2020. Our energy mix has changed a lot in recent years and continues to evolve—by 2026 we will have removed more than 700 megawatts of coal-fired generation from our 2,050-megawatt system. We’ve already added 620 megawatts of wind and 10 megawatts of solar energy, but we can’t rely on these renewable sources of energy to be available all the time. Sometimes the wind doesn’t blow and the sun doesn’t shine. That’s when natural gas, an economical, abundant and flexible energy source with less carbon dioxide emissions, can fill the gap and help keep the lights on. The premier site in Superior, Wisconsin, is shovel-ready and boasts access to multiple interstate natural gas pipelines and nearby transmission lines that can efficiently get the electricity to customers. It also brings with it a joint owner in LaCrosse, Wisconsin-based Dairyland Power Cooperative that serves customers in western Wisconsin. The facility has economies of scale and efficiencies that wouldn’t be available if we were to build a smaller unit on our own. The Nemadji Trail Energy Center will be a combined-cycle facility between 525 and 550 megawatts and will cost about $700 million to build. The power plant will employ 22-25 people when completed, and create an estimated 260 construction jobs and 130 indirect jobs. Because of its proximity to Minnesota, the facility is expected to bring benefits to both states. We are committed to keeping rates competitive for all of our customers and know that energy costs are critical to the region’s natural resource-based industries. Competitive and stable energy costs for residents and businesses help keep the region’s economy healthy. The resource package is a vital piece of the changing energy landscape and provides least cost power supply to our customers. Our transmission and distribution network safely and reliably delivers electric energy from where it’s generated to where it’s used by customers. Since 2009, we’ve invested more than $400 million to replace aging infrastructure, enhance security, prepare for outages caused by extreme weather events, support the integration of more renewable resources, comply with federal standards, and add more lines to meet customer needs. In addition, new technologies such as Advanced Metering Infrastructure will help deliver the benefits of the smart grid and give customers more convenient ways to manage their energy use and costs. About 30 percent of the electricity we generate comes from renewable sources. By about 2026, we expect 44 percent of the power we produce to come from wind, water, wood and the sun. Wind: The 500-megawatt Bison Wind Energy Center in wind-rich North Dakota generates power for our customers in northeastern Minnesota. Our Taconite Ridge Wind Energy Center is the first commercial wind energy center in northeastern Minnesota. We plan to add another 250 more megawatts of wind power by 2020. Hydro: Minnesota Power is the largest hydroelectricity producer in Minnesota. A series of upgrades have made our hydro stations even more efficient. Beginning in 2020, we plan to move more than 350 megawatts of hydropower a year from Manitoba Hydro to our customers in Minnesota. Solar: A 10-megawatt solar installation at Camp Ripley is helping us meet the state mandate requiring utilities to produce 1.5 percent of their electricity from the sun by 2020. We are planning for another 10-megawatt solar facility to be operating in 2019. A community solar garden made up of a 1-megawatt array and a 40-kilowatt array is now online, too. Boswell 4 is the largest and newest of the four generators at our Boswell Energy Center. At 585 megawatts, Boswell 4 provides a big portion of the electricity our customers need. To keep it running, we had to meet requirements of the Minnesota Mercury Emission Reduction Act and the federal Mercury Air Toxics Standards Rule. That meant installing new emissions-control technology. Minnesota has set a goal of reducing statewide carbon dioxide emissions 30 percent compared to 2005 levels by 2025. Minnesota Power expects to reduce its CO2 emissions by 40 percent by 2030. We retired one of the three coal units at Taconite Harbor and idled the remaining two units in 2016. All coal operations at the plant will cease by 2020. We’ll retire two small generators—or about 130 megawatts—at Boswell Energy Center in 2018. We plan to add 250 megawatts of wind power by 2020, bringing our total wind generation to 870 megawatts. We’re helping customers save energy in their homes and businesses through our energy efficiency and conservation programs. We converted Laskin Energy Center from coal to a natural gas peaking facility. We also plan to add 250 megawatts of renewable-enabling natural gas generation by 2025. 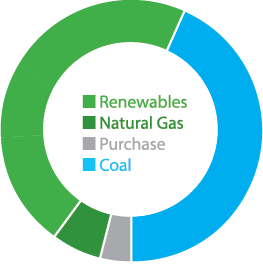 Natural gas has about half the emissions of coal. CO2 emissions will decrease even more when the Great Northern Transmission Line begins delivering carbon-free hydroelectricity from Manitoba to Minnesota beginning in 2020. Our energy efficiency and conservation programs provide homeowners, businesses and communities with tools for saving energy. These programs have exceeded state energy conservation goals for the past 8 years, and we plan to offer additional options and ideas to help customers be even more energy efficient. We’re balancing the needs to preserve reliability, improve environmental performance and minimize cost increases. While we’re moving toward a more diverse energy supply, we also need to be realistic about how we provide power 24/7 to keep the lights on, businesses running and communities thriving. Using a balanced mix of renewable fuels, renewable-enabling natural gas and baseload coal to generate electricity ensures customers will have the power they need, when they need it, at a reasonable cost. Click here to view the Energy Forward Resource Package.